Whenever we get back from vacation, Eric and I have a sort of detox week. We eat salads, try to get back into the regular workout routine, and try to shake off the jet lag. Today, with snowpocalypse painting our windows white, we came home early from work for a night of wine, The Wire, and this kale salad. The candle is burning, the down blanket is on the couch, and we’re watching the storm – it’s nice to eat a healthy salad knowing we can’t brave the outdoors for a run. I had a similar salad at Prune in New York. It was a simple salad with pine nuts, parmesano reggiano, and a lemon olive oil vinaigrette. I added a few more nuts and seeds, and at the last minute, I decided to throw in warm garbanzo beans. It was a good choice. A poached egg would be excellent with this as well. Last night was the first night we could get groceries, so tonight was our first real night of home cooking, and I figured a healthy, nutrient-rich salad was in order. With all the news of the impending snow storm, grocery stores were packed to the brim last night. No parking spots, no carts, picked-bare shelves, and 30-minute waits to check out were the order of the night. I picked up the last bunch of lacinato kale and tried to round up the rest of what I needed. Paired with a bottle of wine, this dinner made for a nice, healthy, indoors kind of night. measurements here are rough – vary the ingredients depending on how big your bunch of kale is. 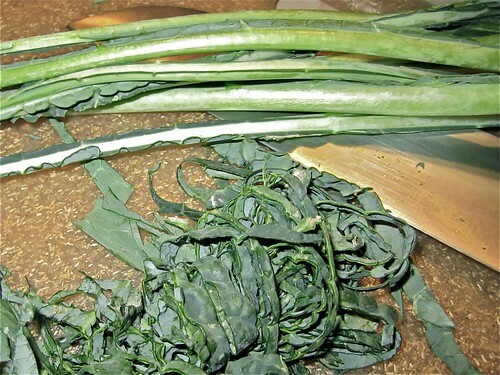 Prepare the kale by removing the thick stems, then roll up the leaves and chiffonade the kale (aka, cut into thin strips). 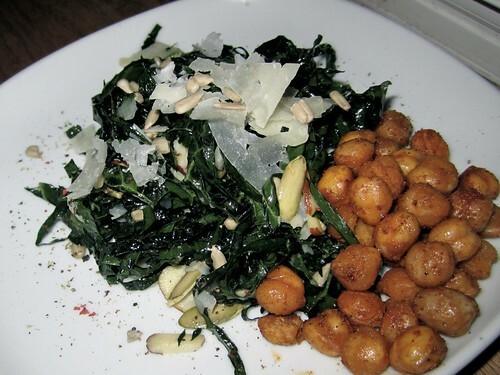 Toss them in a bowl with the olive oil and let it marinate while you prepare the garbanzo beans. Heat an oven to 450. Drain and rinse the beans, then dry them off, removing any husks that rub off in the process. Toss them with olive oil and the seasonings of your choice. Roast in the oven for 10 to 15 minutes – they’ll turn a dark, golden brown and will be crispy on the outside, creamy on the inside. Toss the kale salad with the rest of the ingredients – vinegar, lemon juice, salt, pepper, cheese, and the nuts and seeds. 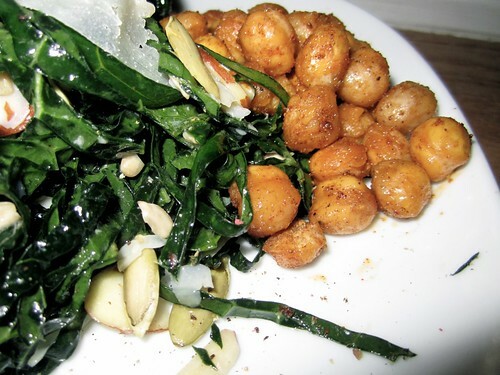 Serve with the warm garbanzo beans.